Enter through an impressive, lead light door to Kitchen/Dining Room with tiled floor, oak units, dishwasher, washer/drier, ice-box fridge and separate free standing freezer; WC; Sitting Room with luxury leather sofas, log burning stove, Freeview TV, DVD player with selection of DVD`s and iPod dock. Upstairs: 2 bedrooms: a king size with TV and en-suite shower room and a twin room; the Bathroom has an oyster shaped bath with shower over. Both bedrooms have vaulted beamed ceilings with reduced height at the eaves. Central heating and log burning stove. Wireless broadband. Bramble and Tanglewood Barns are located three quarters of a mile west of Winfrith Newburgh down a 250 yard, private track, off the Dorchester/Wareham road. The owner's house and two other properties are 25 & 50 yards away respectively. This large splendid brick barn has been converted into two identical properties (Bramble Barn and Tanglewood Barn),creating accommodation of the highest standard throughout. Each barn has its own sheltered south facing terrace, ideal for eating out, and the remaining garden is laid to lawn with paved paths, flowers and shrubs. The garden is enclosed with feather edge and picket fencing. Tadnoll Heath, a Dorset Wildlife Trust Reserve, lies just to the north; to the south are fields with views of the Purbeck Hills. Ample parking. Shop 1 mile; Pub 0.75 miles. Enter through an impressive, lead light door to Kitchen/Dining Room with tiled floor, oak units, dishwasher, washer/drier, ice-box fridge and separate freezer; WC; Sitting Room with leather sofas, log burner, Free Sat TV and Bose iPod dock. Upstairs: 2 bedrooms: a King size with TV and en-suite shower room and a twin room; the Bathroom has an oyster shaped bath with shower over. Both bedrooms have vaulted beamed ceilings with reduced height at the eaves. Dogs are welcome, an additional charge of £15 per dog per stay is payable. Dog bowls and a large dog bed are provided. We have a large field at the rear of the barn that guests are welcome to use to walk their dogs. 1 very large wooden storage box is provided filled with wood as part of your stay. We also provide fire lighters, newspaper and lighters to light the stove. Children's plastic plates, bowls and cutlery also provided. Bose sound system provided in kitchen which is portable. Some toys are provided in the cupboard under the stairs - if anymore are needed please feel free to ask. There are several golf courses within easy driving distance of the Barns, East Dorset Golf Club being the closest approximately 7 miles distant. Great property and in an excellent location. The Barn was fully equipped and very comfortable in every way. We would happily recommend to both friends and family. This property had absolutely everything we could possibly need. We really didn't want for anything! We used this property as our base to visit relatives in Weymouth. We visited tyneham, monkey sanctuary, lulworth, durdle door, rinstead bay and more. The beaches were all so close but we ran out of time so we definitely book to return. We enjoyed a couple of BBQs at the cottage and had a couple of family film nights. The property was so spacious too. The bedrooms were so comfortable and decorated to a beautiful standard. We had a lovely meal just down the road at The Seven Stars too. Lyndsey and Tony were great and there if you need them for absolutely anything. A lovely touch was the welcome wine and chocolates. We had a great few days with our family of 5 and 2 dogs. The owners were really helpful and friendly, even providing a dog crate for our puppy who was going through a chewing phase! Lots of things to do in the area and we were really impressed by how dog friendly the area was. We had a very nice holiday. The property was home from home and the wood burner was particularly welcome and so nice to have. Our dog was very well catered for and having a fully enclosed garden was perfect for him. The only thing that could have made our stay better would have been better WiFi connectivity, but that was a minor thing. Thank you Lyndsey and Tony for the very warm welcome. 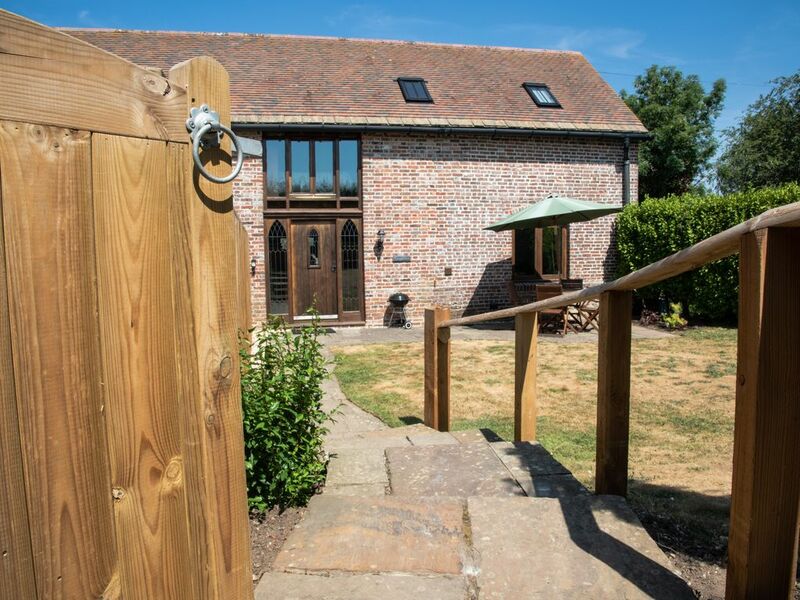 Bramble barn is situated in a lovely location with lots of walks from the door and very dog friendly. The cottage itself had everything you needed, clean, light & cosy in December but with a nice lawn out the front with table & chairs for the summer. Will definitely be back if the owners will have us.